Where do I use my CigaBuy voucher code? 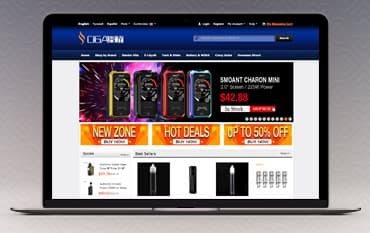 You can find a huge selection of products at Cigabuy including Ego starter kits, compact starter kits, mod style starter kits, sub-ohm tanks, rebuildables, 510 tanks, atomizers, wicks and wires, coils, RDTAs, drip tips, accessories, various kinds of mods, batteries and chargers, all for affordable prices. As well as all this you can also discover a wide variety of e-liquids in a multitude of flavours including USA mix, classic cigarette flavour, mint, fruit and drink flavours as well as sweet, premium, fragrance and nicotine free flavours. Cigabuy boasts an overseas direct section on their website where you can find prices for the USA, UK and the rest of Europe. Get your e-cigarette supplies from top brands delivered to you all over America, the EU and the UK for great prices, allowing you to enjoy the best vaping experience no matter where you live. You can also enjoy great savings in the crazy sales section where there are weekly deals, a clearance and a combo deals category. E-liquid is the most crucial component to any e-cigarette which is why there are so many flavours available at Cigabuy. Choose from various flavours including the USA mix, classic cigarette flavours, mint flavours, fruit flavours, premium flavours, sweet flavours, fragrance flavours, drink flavours and none nicotine flavours. All these flavours come in different variations including mango, peppermint, menthol, apple, banana, red energy, grape and many more. If you’re looking to switch to a more healthier lifestyle or simply love vaping and want to give it a try then check out the starter kits at Cigabuy. With a huge array of starter kits available including eGo starter kits, compact starter kits and mod style starter kits, Cigabuy provides plenty of options when it comes to getting to grips with your e-cigarette. All kits available include an e-cigarette pen, spare coils and accessories, a charger and starter liquid in whatever flavour you’d like to try first. So, whether you’re an ex-smoker looking for a healthier way to consume nicotine, or you simply love to vape and want to try all the flavours available, at Cigabuy you can find the ideal liquid and starter kits for you. You may return undamaged items to Cigabuy within 45 days of delivery. How can I contact Cigabuy? If you need to contact Cigabuy please use the contact form that can be found here. Cigabuy stocks a huge variety of e-cigarette supplies including starter kits, e-liquid, tanks, RBAs, batteries and MODs from top brands like Smoktech, Wismec, Joyetech, Geekvape, Vandy Vape, Uwell and many more. Shop online at Cigabuy with a discount code from us and save money on all these products, from the very best names. You can also enjoy great savings in the sale section where there’s up to 50% off.